A very interesting set of propositions. First, how do you build something that will last 10,000 years? And second, 10,000 years from now, how do you let others know that you've built this something? This is especially important if the thing you've built is designed to store, of all things, nuclear waste. 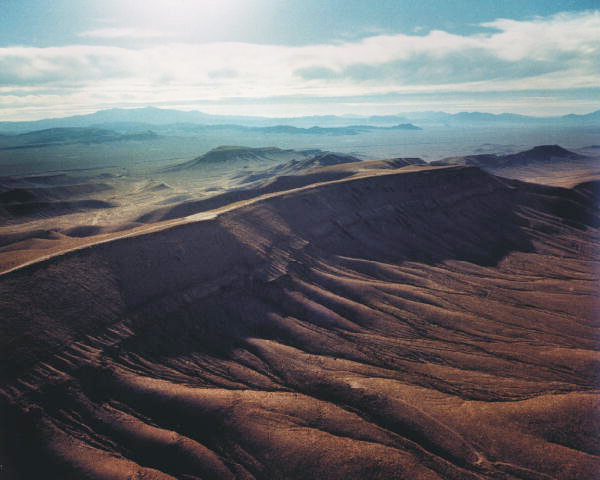 As we all know, the controversial Yucca Mountain Repository is a giant site located inside a mountain designed to handle and store spent nuclear reactor fuel and radioactive waste. Because of the long half-lives of the various radioactive materials to be stored inside the mountains, the Department of Energy took on the task on building a structure that would last as long as needed to accommodate the 10,000+ year process of radioactive decay. This type of building would prevent contamination of human environments at least until other types of technologies can be developed to handle the problem. As part of the contract, the Department of Energy entrusted the Nuclear Regulatory Division with creating signage to be deployed at Yucca Mountain warning future generations of what is actually inside the mountain. 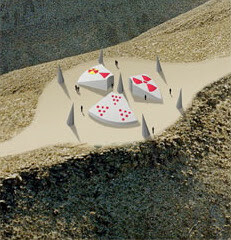 According to the U.S. Office of Radioactive Waste Management (OCRWM), the signage system placed along Yucca Mountain constitutes "a redundant message system consisting of perimeter monuments, smaller markers, and larger monuments serving as information centers" that "would convey information by an unnatural-looking design, the strategic placement and use of materials, and the use of many languages and symbols." These messages would be inscribed about 40 inches or higher above the ground’s surface to prolong legibility. To better withstand corrosion and erosion, the monuments could be constructed from either granite or basalt. The messages must survive natural forces and remain legible and comprehensible as long as possible. Natural factors to be considered are abrasion from wind-borne particles, general surface erosion, and “desert varnish,” a dark coating or polish often found on rock surfaces after long exposure in desert regions; desert varnish is typically caused by a buildup of iron and manganese oxides. The shapes and dimensions of the monuments are also important factors. The current concept calls for the perimeter monuments to be six-sided cones pointing upwards at varying angles. As shown in the schematic drawing, they would rise out of the ground above the repository near the larger monuments, as well as around the entire surface perimeter of the underground repository. They would be designed to be unnatural-looking so they would draw attention, but not be misconstrued as memorials of honor. The monuments would be accompanied by a series of "nine-inch warning markers ... anchored into the ground and easily visible by a wandering human being. These markers would be designed as a redundant message system. To ensure the markers would last, they could be made of diverse durable materials such as granite, fired clay, and stainless steel. Each marker would display the international radiation symbol and one of the written messages." The project is ambitious in its scale, to be sure. One wonders about the degree of detachment one must employ in order to be involved in such a project. After all, NRC and OCRWM are designing for a time when natural and non-natural landscapes will be altered, when such surfaces will bear the mark of unforeseen climactic change, and when humans will have a completely different relationship with their environments. Perhaps you already know about the Long Now foundation and their plan to build a clock that will keep time for 10,000 years? I always thought this was a really interesting thought experiment kind of thing. But it's also mind boggling that our ability to make toxic garbage exceeds our ability to communicate. Did this come up again somewhere recently? I think it did come up ... I cannot remember exactly where, because it is precisely what inspired me to post this bit about Yucca Mountain. Fascinating. I wonder who are the artists/architects working on this project.... one can imagine some kind of rendering of these monuments thousands of years from now - an image akin to Joseph Gandy's depiction of John Soane's Bank of England in ruins. It also reminds me of Michael Heizer's ongoing "City" project in the Nevada desert, which I think in many ways is in direct dialogue with the Yucca Mountain nuclear waste storage facility.